Within two years time, we will meet in heaven. One should ask God the grace to die near him. 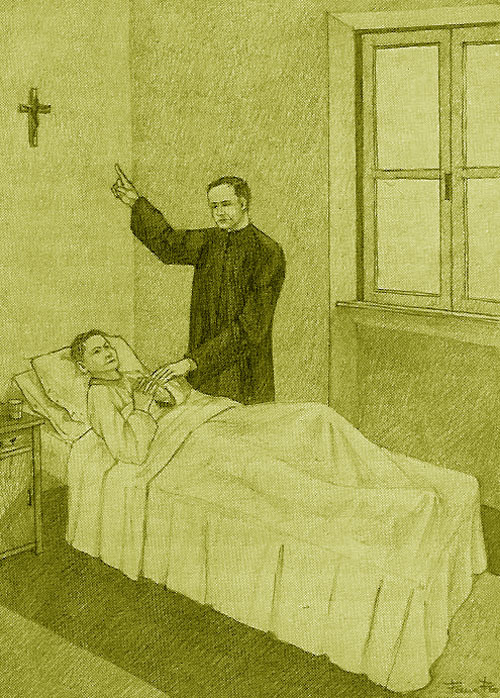 His priestly zeal was to be seen particularly at the bedside of the sick and of the dying. The sick received him with joy and he went at once to their assistance without any thought or regard to his own fatigue. He comforted them, prepared them for their last journey, and was a veritable angel of comfort. Virtually foretelling his own imminent death, he leaned over the bed of a gravely ill youth one day and comforted him saying, “Courage, Courage – within two years we will be together in paradise”. He remained near those dangerously ill day and night and he accompanied the parting soul by his prayers to the throne of Judgment, and this not only in the case of the well-to-do, but in every case and everywhere where there was a pain or sorrow to be relieved to the Servant of God was always present. For three years in the Church of Christ the King, with his old confreres in the Congregation of which he felt himself to be a real member, he poured forth all of the zeal of his heart for the welfare of his parishioners and all those who came to him. The beauty of the priestly vocation, the ideal of his own existence, made him forget his own badly undermined health. He had thought perhaps of overcoming it by a tenacious heroism and determined will. But it was not to be. The hidden effects of his illness undermined, disintegrated and finally destroyed his energy. At the beginning of April of 1934, a cough began to trouble him, a cough that gave him no rest, day or night. His companions, seeing him wasting away and often hearing his painful coughing during the long hours of the night, insisted that he have recourse to some remedy and give himself more rest. Anthony however continued his usual mode of living and studying- forgetful of his health. One day a man said to him: “Fr. Anthony, you are burning, you have a fever”. He brushed the remark aside with a sad smile, fearful lest the truth be discovered. His implacable illness was bringing him nearer to heaven- he was already worn out. He wished, however, to celebrate Mass again and on the 28th. And 29th. Of April, he made a heroic effort to do so. He wished to realise in his own case the suggestion of a certain holy priest: “Priests should regard death as a functional act of their priesthood. It is for them their last Mass”. And so it was for Anthony. He had to take to his bed for a period of rest, but it was too late. That same evening his state became serious and during the night he lost consciousness which he never regained. On the first day of May he was transferred to the Quisisana Clinic. His colleagues were saddened by his departure. As soon as the doctors had given him a careful and serious examination they declared that he had but a few hours to live. He received Extreme Unction midst the great grief of all those present. The following day, May 2nd. 1934 Anthony passed away quietly llike the dying flickering of the Sanctuary Lamp in the Divine Presence. Such was his life: a lamp burning for love for God as long as the oil lasts. Zeal in the service of the good God had consumed his vitality and he died peacefully in the arms of his Father. Therefore we may well call his death a blessed one. The news spread rapidly through the parish. Such an unexpected death after such a short illness aroused deep sentiments of affliction and sorrow. His death was all the more regretted, coming as it did come, so suddenly. A continuous queue of grief-stricken mourners filed through the crypt where his holy remains were brought and exposed in the Church of Christ the King. Deeply regretted by all as if he had been a member of the family, his memory was honored by demonstrations of sympathy and veneration by the crowds that flocked to his funeral ceremony. “He was a saintly priest”, was repeated by all, “now he is our protector in Heaven”. The crowds, remembering the words of Fr. 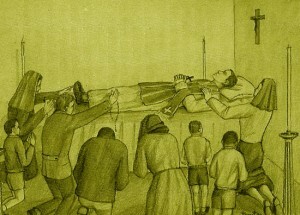 Anthony that “one ought to pray to die close to our Lord”, expressed a spontaneous faith in his power of intercession by asking him to pray for them and by touching objects of devotion to his coffin. After the obsequies his remains were entombed in the cemetery of Rome. 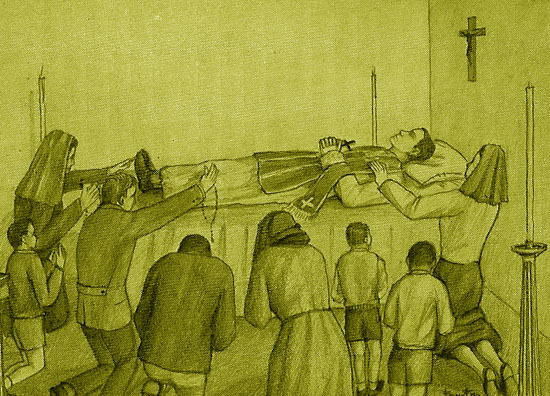 Such was the life of Father Anthony Vincenzo Gallo, Apostle of suffering. A life ever lived, “under the sign of the Cross”.